Creating a Monthly Vision for your Blog - AND 100+ Blog Post Ideas! Creating a Monthly Vision for your Blog – AND 100+ Blog Post Ideas! Can you believe that we are going into the month of August already?! Time seriously flies…before you know it, it will be my favorite season, FALL! What I wanted to talk about today is how I create a monthly vision for my blog so that you can do the same! Bloggers tend to struggle with staying consistent. Many find it hard to stick to a posting schedule! Before you know it, the month is up and you have only published one blog post!! When it comes to blogging consistency is extremely important! Your readers are looking forward to new content and you want to make sure you are always delivering! Consistency can also help build trust with your audience, which in the long run, will bring you more sales. I first want to mention that this post is sponsored by one of my favorite planner companies – bloom Daily Planners. I am obsessed with my vision planner and Bloom Daily Planners was kind enough to send me one of their newest vision planners from their collection! This post is going to be all about how I use my vision planner to help create a vision for my blog each month! Not only does this help keep me consistent, BUT it helps to keep me organized and motivated as well. Disclaimer: Affiliate links are used. Read more about that here. When you first open your planner you will see an inspirational quote of what BLOOM stands for which I personally LOVE. I think my favorite part about my vision planner is that it is FILLED with inspiration and motivational quotes. “Be inspired, Love yourself, Outline your vision, Organize priorities, Make it happen.” – bloom Daily Planners. In your planner you will find a spot where you can plan out your yearly blog goals and visions. What is it that you hope to accomplish in a year? You can break your goals down. Social Media Goals – Do you have certain goals for your social media? Do you hope to grow to a specific number of followers? Do you hope to score sponsored posts and brand collaborations? OR maybe your goal is to be more personal and go outside of your comfort zone by reaching out to your audience via Insta stories or IGTV! Whatever those social media goals are – WRITE THEM DOWN. 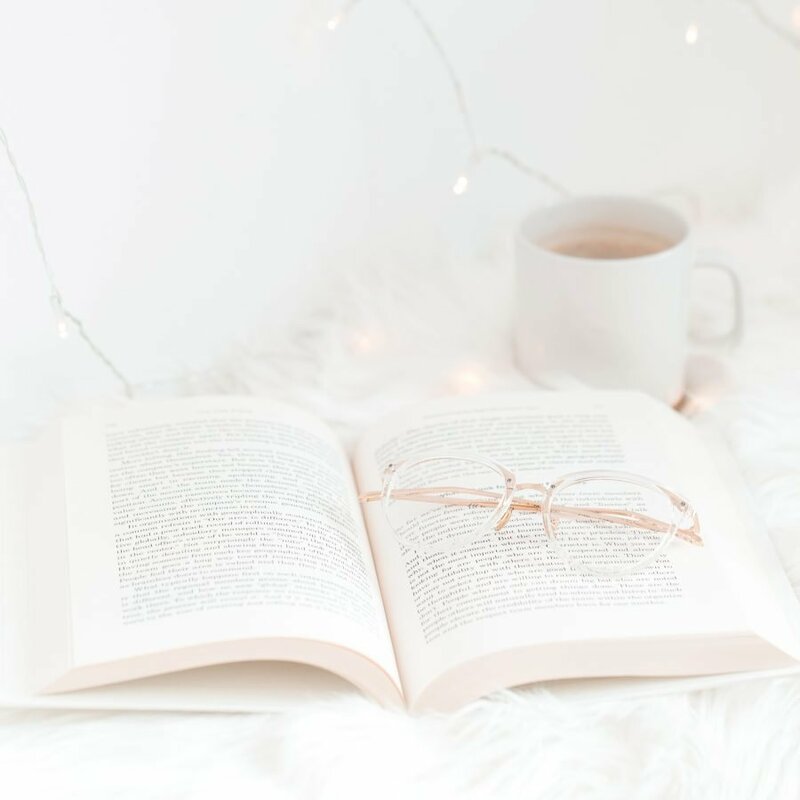 Blog Goals – Now you have to think about what goals you have for your blog. Do you hope to have a specific amount of blog traffic by next year? Do you want to make a specific amount of money through your blog? What about your blog appearance? Do you want to rebrand? Change the theme? Go self hosted? Be more consistent? Change your niche? WHAT ARE YOUR GOALS?! Write those down too! You can see that there are areas in your vision planner where you can write down what you wish to improve on, places you want to travel to, goals, and new things to try! Take advantage of your vision planner and really write down EVERYTHING you want to accomplish. I love writing out my goals because it helps bring my vision to life. It also inspires and motivates me. Your vision planner will also come with a weekly scheduling template! You can use this to help schedule anything! Whether it be clients, blog posts, or even social media content! I personally don’t use this section for my blog post scheduling… I will talk about that in just a bit. BUT I do enjoy using this to schedule clients. Whenever I book a new client I will use my scheduling template to stay organized and to help make sure that I am not over booking myself. You can really use this for whatever you think works best! NEXT – your vision planner will come with a bucket list. You can use this to write down things that you wish to accomplish in the next year. It can be goals and adventures related to your blog OR just general things you want to accomplish. What I love MOST about my vision planner is that each month there is a new inspiring quote as well as a section where you can write out your monthly vision! Now for the fun part…. Planning out my content for the month! I try to be as organized as possible. I am someone who likes to have their blog content planned out a month in advanced! If I have my content planned out ahead of time, I am able to stick to a more consistent schedule. I tried this last month and I was able to publish more blog posts than ever before! AND I noticed my blog traffic rising because I was posting more consistently. It’s a win/win! So how do I plan a month in advance? FIRST – Throughout the month I collect blog post ideas. I usually will write my ideas out as they come to me. I use my phone notes or I use my planner if it’s near me. Before the month comes to an end (usually two days before) I will take my blog post title ideas and plan them out throughout the month. I will use my monthly calendar spread to plan when I want each post up by! PRO TIP: If you blog about multiple niches/topics, try to dedicate specific days to each topic. For example shown above -> I chose Sundays for self care/motivation posts, Mondays for relationship advice, Tuesdays for blog tips, Wednesdays for beauty, and Fridays for fashion! Setting specific days of the week for each niche helps to make sure you aren’t ignoring any of your topics throughout the month. As for writing the actual content, I try to write 2 weeks in advance! This way I know I will have my content written and ready to publish on the date it’s due to go live! It’s so important to stick to your schedule as much as possible if you want to stay consistent! When it comes to blogging it’s all about self discipline. You are your own boss of your blog, only YOU can make it happen! Here is a list of blog post title ideas for different niches! Sometimes this can help spark inspiration and motivation to start writing again! Since it’s almost fall I will throw in some fall related topics as well! **You should start publishing your seasonal content 45 days prior (promote them on Pinterest 45 days prior as well!) If you still aren’t using Pinterest to promote and grow your blog traffic, I think you should definitely learn!!! This course is so helpful and will teach you all you need to know about Pinterest and growing your blog traffic! I hope you found this post helpful! I also hope that it brought you inspiration and motivation to start becoming a more consistent blogger! Summer is usually slow for us bloggers, but since fall is right around the corner, blog traffic should be picking back up! What better way to start a new season than with a new vision for your blog! & don’t forget to purchase your own vision planner – let’s slay some goals! 17 Comments on Creating a Monthly Vision for your Blog – AND 100+ Blog Post Ideas! I love this planner!! And thank you so much for the post ideas! So glad you found it helpful! I love my planner, I am a planner addict haha!! That honestly makes me so happy to hear! Thank you so much love! Great post ideas! I definitely need to start planning my post in advance to eliminate falling off being engaged with my followers. Thank you! I read the other one too, the one about accomplishing the goals. It was spot on!